Windows provide light and views to the outdoors but the heat loss through even a double pane window can still be up to 10 times the heat loss through an insulated wall. Window treatments can boost the R-value of windows as well as add to the decor of a room. I'm working on a plan to redecorate some rooms of my home and have come up with the following window treatments plan to help keep the cold out during the winter. There were a few key features I was interested when I was planning out my window treatments. Energy Efficient - First and foremost I wanted my window treatments to help make the room more comfortable. Provide Privacy and Light - I'm currently using opaque blinds which provide me with privacy or light but not both at the same time. Light Control - If I'd like to darken the room I have that option. Attractive - The window treatments should add to the aesthetics of the room, not detract from it. Just like dressing in layers to keep warm, dressing the windows in layers also helps increase the energy efficiency, versatility and visual appeal of the windows. The layers will consist of bubble wrap stuck on the glass (for some windows), a double cell honeycomb shade and a set of thermal lined drapery panels capped with a closed top window cornice. This will create additional 4-5 additional air pockets, in addition to the air pocket within the double pane glass, which increases the insulative capacity. 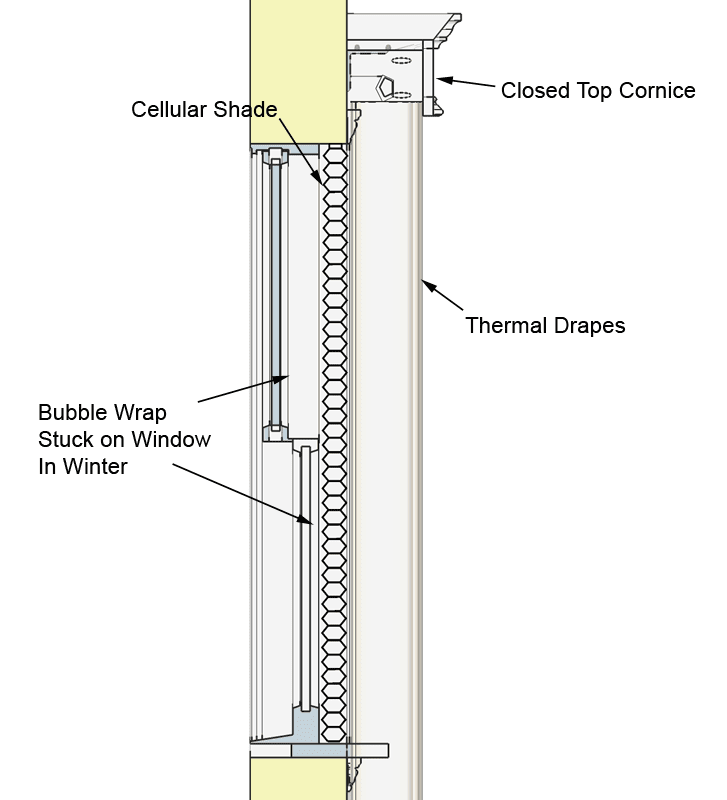 The first air pocket is within the bubble wrap, second is between the window and cellular shade, 2 air pockets within the cellular shade and finally the air pocket between the shade and drapes when the drapes are closed. The bubble wrap increases the insulation of the window. It will obstruct the view but will still allow light to pass through. It will be applied to the windows once the weather drops and removed when it starts to warm up and only used on windows that I don't care too much about the view. The bubble wrap needs to be cut to fit the glass of the window. Mix up a solution of water with a drop of liquid soap and spray it generously over the glass and press the bubble wrap on the window just like when applying window film. It will keep the bubble wrap in place and make it easy to remove in the Spring. If stored carefully the bubble wrap should last a number of years. The next layer will be double cellular shades which help insulate the window by providing 2 air pockets within the shade. The shades are light filtering so they allow some light to enter the room even when the shades are covering the windows. Many come with a top-down/bottom-up feature which allows the shade to be lowered from the top to allow for more light and a bit of view while still providing privacy. The one drawback compared to blinds is that you can't have good air flow and some light and privacy. 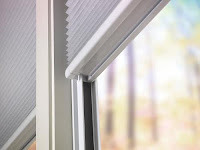 The most energy efficient cellular shades I've seen are these Comfortex Energy Efficient 3/8" Double Cell Shades. In addition to providing the increased r-value that double cell shades do, their ComforTrack side track increases the r-value by about 17% (r-value 3.3 vs 2.8) by further restricting airflow at each side of the shade where it meets the window jamb. The shades are also available as blackout shades if you're interested in installing them in a home theater or bedroom. Personally I like the idea of light filtering shades with room darkening or blackout curtains instead of blackout shades. The Comfortex Energy Efficient Cellular Shades aren't cheap. They're about twice the price of the Blinds.com 3/8" Double Cell Shades which don't come with a track but do provide better insulation compared to my current blinds. To further increase the energy efficiency as well as provide additional light control a pair of thermal lined curtains will go over the window and shades. A couple of years ago I installed 2 different types of thermal/blackout curtains. Some were Eclipse Blackout Curtains and the others were from Best Home Fashion . While they're both labeled as blackout curtains they didn't block all light from coming in, at least not in the light colors I purchased them. They did dramatically darken the room though and helped the room feel more comfortable during the winter. When the heating system is on, air circulates around the room through convective currents. Warm air rises, cold air falls. To minimize the amount of air that passes behind the curtains, and thus reducing heat loss, a closed top window cornice will be installed. You can view my instructions on http://littlebitjohnny.blogspot.com /2012/10/diy-wood-window-cornice.html" target="">how to build a window cornice. You have finished reading Energy Efficient Window Treatments and many articles about Tech Gallery in our blog this, please read it. 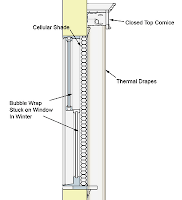 and url link of this article is https://littlebitjohnny.blogspot.com/2012/10/energy-efficient-window-treatments.html Hopefully discussion articles on provide more knowledge about the world of new tech gadgets.